In about 17 hours, the contest for a chance to win all five of my print books at Catholic Sistas closes. My recent column at Catholic Mom is entitled “God’s Plan for a Joy-Filled Marriage.” Check it out here. As baptized and confirmed Christian/Catholics, Christ resides in each of us. If we consider the love that Christ gave us when He died on the cross was His freely chosen gift, totally given, faithful to the point of death and that gift was fruitful (redemption of mankind that opened up the gates of heaven), and if we consider that we are called to image Christ, then we must love our spouse in the same way. Click on one of the links above to read the rest. 3. New Review for A Subtle Grace! White House Petition (To get Obama to intervene…you have to create an account to sign. I tried for over an hour a few nights ago trying to get onto this site, but couldn’t and finally succeeded last night). Consider attending the upcoming Catholic Writers Conference Live just outside of Chicago. We’ve got great speakers coming and a few surprises too! If you have pre-teens, they will love these delightful books! And, last but not least, I’d like to wish my younger but taller brother a very happy birthday today!!! Please join me and other Catholic bloggers at RAnn’s Place for Sunday Snippets, where we share posts from the previous week and answer a weekly question. This week’s question: What are your plans for this summer? Other than taking it easy, we do have plans to attend the Catholic Writers Conference Live in Chicago. We will also be visiting my extended family down in New Jersey and possibly take a trip to visit the Statue of Liberty. 7 Quick Takes Friday – Anniversary, Reviews, Giveaway Two new reviews (thank you, Carol and Jean!!) and a link to a huge giveaway at the Catholic Sistas website. From the President’s Desk – Inspiration and CWCL A brief post on inspiration and the upcoming Catholic Writers Conference Live in Chicago. 7 Quick Takes Friday – Anniversary, Giveaway, Reviews Etc. This past week, my husband and I celebrated our 32nd anniversary. It’s hard to believe we’ve been married that long! We went to breakfast at our favorite diner, spent the morning at the National Gallery in Ottawa, then attended Mass at Notre Dame Cathedral. Jean Heimann at Catholic Fire always has wonderful things to say about my books. Her recent review of my newest book is no exception!! Thank you, Jean! Special thanks to Carol at Simple Catholic Living for this lovely review of A Subtle Grace. Would you like to win all five of my print books?? Go to Catholic Sistas and enter at this link. Or click the picture below. One lucky winner will win all five books! Are you a Catholic writer? Would you like to be inspired by great talks and network with fellow Catholic writers? Come join us at the Catholic Writers Conference Live, which is being held in conjunction with the Catholic Marketing Network Trade Show just outside of Chicago this summer. For more information, check it out at this link. Are you a Catholic writer? Would you like to hear great talks? Come join us at the Catholic Writers Conference Live, which is being held in conjunction with the Catholic Marketing Network Trade Show just outside of Chicago this summer. For more information, check it out at this link. 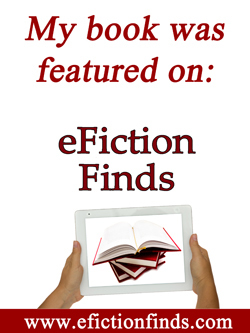 One of Full Quiver’s authors, Erin McCole Cupp, who wrote the lively and entertaining Don’t You Forget About Me, is featured over at CatholicFiction.net with a wonderful, insightful and interesting interview. Check it out here. 3. Happy Wedding Day to Elle and Jack!! My cousin’s daughter (Elle) is marrying her sweetheart (Jack) today! Elle is my namesake and an amazing young woman! I wish we could’ve attended the happy nuptials, but unfortunately, we couldn’t. We’re there in spirit, though! And take a look at their wedding website!! Congratulations to two amazing people! We wish you the most wonderful wedding day and a lifetime of love and joy! 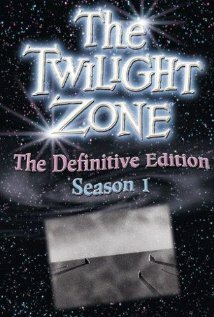 One of my favorite classic TV shows is The Twilight Zone. One of my sons bought me Season 1 for my birthday and I’ve been thoroughly enjoying it (I’ve been watching episodes while on the elliptical). This was a show that was ahead of its time in many respects…from the unusual and creepy opening music, to the relevant topics and brilliant writing. It was also a favorite of my father’s and we often watched the show together when it first aired. Remember last year at this time? My husband had a run in with the law trying to take a photo of this sign. I asked and, like the dutiful husband he is, he obliged. Read all about it here. “The Beauty of Faith: Using Christian Art To Spread the Good News” – Jem Sullivan PhD. 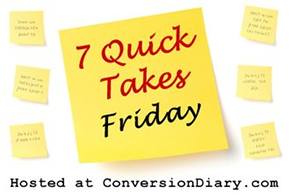 Please join me and other Catholic bloggers at Conversion Diary for 7 Quick Takes Friday, where we share seven quick posts! LifeSiteNews reports there were over 23,000 on Parliament Hill yesterday for the annual March for Life! (For Canada’s lower population, this is outstanding!!) Unfortunately, I missed it again because of illness, but my second oldest son and his friend were present and had an opportunity to meet and chat with chastity speaker Jason Evert and take a cool photo with him! I’ve been praying for the young girls who have been kidnapped by a radical group claiming that Allah “told” them to sell the girls because the girls wanted an education. On Twitter and Facebook, I’ve been using the hashtag #BringBackOurGirls to bring awareness to their plight. You can also go to this website and spiritually “adopt” one of the girls and specifically pray for her, if you wish. (My girl’s name is Tabitha Pogu.) Jesus, Mary and Joseph, keep Tabitha safe and bring her and all the kidnapped Nigerian schoolgirls to their families. Thank you to all who have already downloaded or bought a print copy of my new book, A Subtle Grace (O’Donovan Family)! I’m connecting with other bloggers over at RAnn’s Place to share my posts from this week. As well, to commemorate Mother’s Day next weekend, she has asked contributing bloggers to share a “Mom” story. Click here to read a few stories about my mother. This is the eulogy I wrote the day after she died, and which I read at the funeral reception. Two new saints were proclaimed by the Church on Divine Mercy Sunday. It was a momentous occasion for many reasons, not the least of which two living popes were present (Pope Francis and Pope Emeritus Benedict). Saints John Paul II and John XXIII, pray for us. My book launch was fun and thanks to all who came out to pick up a signed copy! See more photos from my Wednesday post. 3. My Baby Turns 15!! This weekend, my youngest son turns 15. We had an interesting conversation when we were watching home movies the other day. Me: “Uh, no, I wasn’t. You were just a LOT shorter!! To read more about my favorite birthday gift, click here to read a previous blog post. A Subtle Grace is in its fourth week of being #1 in Religious Drama on Amazon Kindle. It dropped to #2 a few times, but for the most part, it’s been #1!! I’m still humbled by the fact that so many Kindle users are downloading and reading my books. Congratulations to Dena Hunt, author of Treason, who won the 2014 IPPY Award for Religious Fiction!! Treason was one of my favorite Catholic novels from 2013!! Well done, Dena! !